Questions about the Montenegro Croatia border are some of the most frequently asked questions about Montenegro. It doesn’t take much research to realise that Dubrovnik airport is very close to Montenegro and, with plenty of inbound flights, is a great airport to fly into. But then come the questions about the border between Montenegro and Croatia. Don’t worry, all your questions are answered here. And if they’re not, you can ask me in the comments at the bottom of the page. IMPORTANT: The Njivice-Konfin border is closed until summer 2019. Debeli Brijeg – Karasovići is the main border between the two countries. Debeli Brijeg is the Montenegrin border control and Karasovići is the Croatian border control, and there’s around 5km between the two checkpoints. This is the border crossing most people use because it lies on the Adriatic Highway that connects the two countries. Njivice-Konfin is the second border option. It’s much smaller and can’t process the same amount of traffic as the main border. You’ll often see it touted as the local’s secret option, and that was true until a couple of years ago, but it’s quite well-known now. 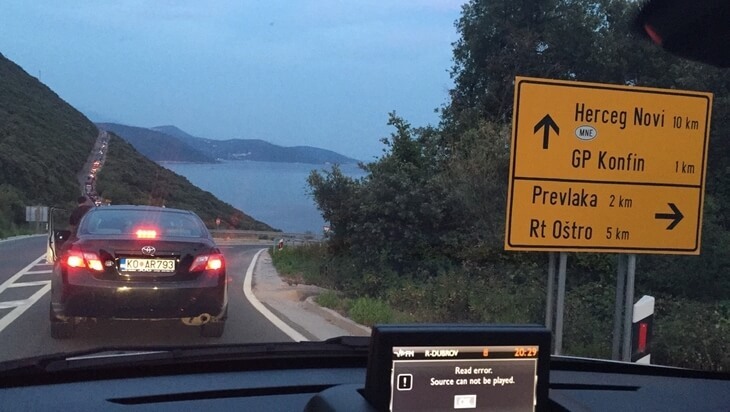 To get to this border when arriving from Dubrovnik, you have to turn off the Adriatic Highway towards Molunat and then follow the country road through Vitaljina until you get to the border crossing. When starting in Montenegro, you have to turn off the highway towards Njivice (opposite Novi Mall shopping centre) and follow the road until you get to the Montenegrin border checkpoint. Before you choose your border, make sure you have the right paperwork here. The Croatian side of the Njivice-Konfin border in July. Total crossing time: 3 hours. Is the Montenegro Croatia border really as bad as they say? The answer to this isn’t straight forward. In July and August, the wait time at either border can be anywhere from 20 minutes to several hours. It’s very unpredictable. As a general rule, the wait time will be shortest very early in the morning, around 5-7am. So if you can haul yourself out of bed before dawn, you can save yourself a few hours of waiting in the hot sun. The rest of the day will be busy through into the night as people enter and exit Montenegro and Croatia. The good news is that outside of July and August, getting through the borders is significantly faster. Crossing usually takes 20 minutes, or up to an hour on a busy day. Considering you have to go through two checkpoints, it’s not too bad. My advice: if you’re visiting in July or August, try to get flights into Tivat or Podgorica airports. If you do fly into Dubrovnik, consider spending a night there and then crossing into Montenegro early the next morning. Or spending the day there and crossing over in the evening, when it’s cooler. A great way to check the current status of the border is to check the Karasovići webcam. Of course, the length of the queue can change at any time, but it’s a good resource for checking the status of the border. Click here to go to the webcam. There’s no corresponding webcam for the Njivice-Konfin border and there are no webcams on the Montenegrin border checkpoints unfortunately. Most people who fly into to Dubrovnik hire a rental car there and drive across into Montenegro. It’s only 20 minutes by car from Dubrovnik airport (in an area just out of Dubrovnik called Ćilipi) to the Croatian border, and only 45 minutes in total to Herceg Novi in Montenegro. If you’re hiring a car in Croatia, or coming with your own car, you’ll need border insurance, commonly called a zeleni karton or green card here. The card gives you third party insurance cover in Montenegro. You can find out more about the Green Card scheme here. Most rental car companies in Croatia are happy to issue you with the green card for Montenegro when you collect the car. If you don’t get it from the rental company, or you’re coming in your own car, you’ll have to buy the insurance at the border if Montenegro isn't covered on your existing policy. Currently the price for insurance at the border is €15 for 15 days, €28 for 30 days and €205 for a year. You can find the full list of tariffs for all vehicle classes here. When you get to the checkpoint, tell the guard you need to buy insurance and they’ll point you over to the Sava office, where you can buy it. You’ll need your ownership/registration papers and your current insurance. It’s important to note that you can only buy insurance at the Debeli Brijeg border. If you need it, you must arrive in Montenegro via this checkpoint. Getting a private transfer across the border is an easy way to cross between countries if you don’t have a car. Unfortunately, and contrary to some claims, there’s no special lane or crossing for taxis, so the wait is the same as if you were crossing in your own car. There’s a daily bus linking Kotor, Tivat and Herceg Novi with Dubrovnik which crosses the Debeli Brijeg-Karasovići border. There’s a special bus lane, which means the bus skips the long summer queue, but the actual crossing can take up to 30 minutes at each border (versus the usual three minutes). Sometimes everyone on the bus has to get out and get their passports stamped individually, which can take a long time. The bus doesn’t stop at Dubrovnik airport, so if you’re arriving there and want to catch the bus, you’ll need to get a transfer to Dubrovnik town (there are group transfers available for most flights into Dubrovnik) and then get the bus from Dubrovnik’s main bus station. You can find the timetable on the Blueline website here. So don't be scared of crossing the Montenegro Croatia border during your stay! Armed with this knowledge and a little planning, getting across the border needn't be a hassle. Got a question? Scroll down to the comments below to ask.